Posted on March 16, 2015, in Uncategorized and tagged Children, Dogs, Doodlemum, Drawing, Family, Humour, Illustration, Life, Pen and Ink, Sketchbook. Bookmark the permalink. 10 Comments. Oh NO!! This has happened with other things in our home!! EEEK!!! 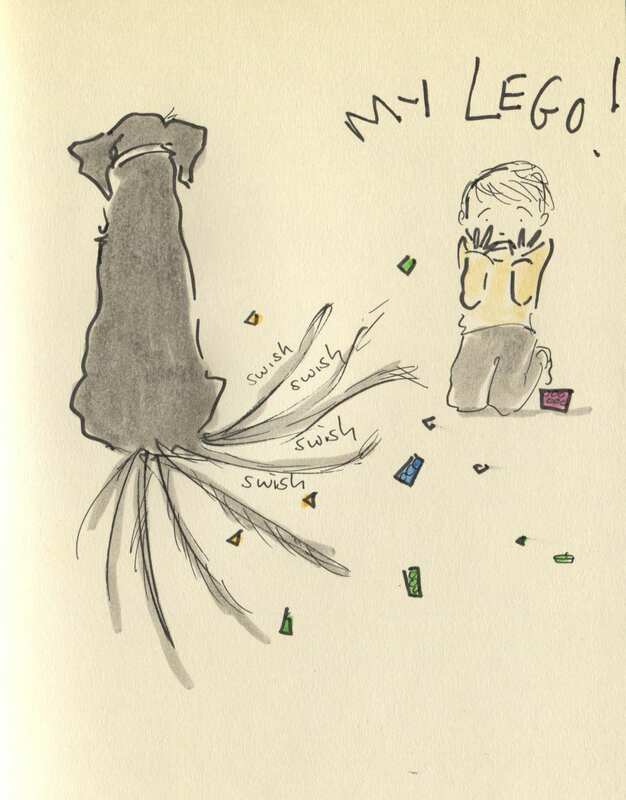 Oh poor Gruff…..and poor you- you’ll be finding tiny lego pieces that have been swept across the room and under sofas, for weeks. Mind you, that’s probably a daily occurrence, anyway! Swish that tail, Bonnie….can’t you attach a duster to the end of it?! This is so cute and so true! Love it! Just fabulous. We have vast experience in enthusiastic tails! Legos REALLY hurt when you step on them. It feels like stepping on a bear trap. I’m amazed that the dog didn’t get hurt from sitting on them. Laugh out loud.